Subtitle: Learning std::filesystem through file_size routines. Last week I wrote a short post that explained how to use std::filesystem::file_size. Today I’d like to continue and show some significant differences that this new functionality has over the “older” techniques (like reading a file and getting its file position). We’ll also learn something about permissions and how to manage them in std::filesystem. 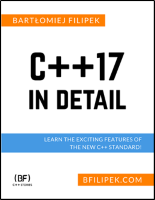 What are the advantages (besides shorter code) over the existing C++ methods? Is this method faster? 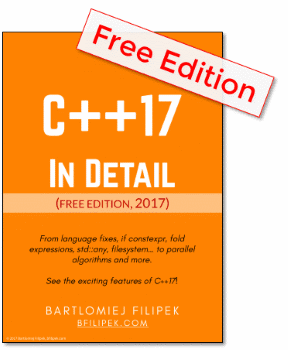 The other, popular technique that is available in C++ (apart from using third-party API) is to open a file and then read its file position (with tellg()). The first question we may ask is - how about file permission? What if you cannot open a file? We can read the current file permissions and show them. std::cout << " group: "
std::cout << " others: "
But how about changing permissions so that we cannot open the file for reading, writing or executing? fs::permissions is a method that allows us to set permissions - we pass a flag that we’d like to change (it’s a bitmask) and then “operation” - remove, replace or add. In our case, I’m removing all owner permissions from the file. perms::owner_all is composed of owner_read | owner_write | owner_exec. No matter the permissions of the file (common permissions like read/write/exec), we can read its size. While there’s no need to have read/write/exec rights for the file, we need a parent directory rights to be correct. That’s why our demo code won’t work. Disabling read access for a file does not affect. Since there’s no need to read the file… then std::filesystem methods should be faster… isn’t it? What’s more, directory_entry method might be even faster as it should be able to cache the results for a single path - so if you want to access that information many times, it’s wiser to use directory_entry. you can play with a demo code here @Coliru. The test is run N = 10'000 times. filesystem::file_size     : 2543920 in 21 ms.
homemade file_size        : 2543920 in 66 ms.
directory_entry file_size : 2543920 in 13 ms.
filesystem::file_size     : 1200128 in 81 ms.
homemade file_size        : 1200128 in 395 ms.
directory_entry file_size : 1200128 in 0 ms.
homemade file_size        : 1200128 in 390 ms.
It’s interesting to see that the directory_entry method is almost no-op in comparison to other techniques. But I haven’t measured the first time access. In this blog post, we’ve shed some light over the file_size function. We covered permissions that are required to get the file status and also compared the performance. While getting a file size is probably not the crucial part of your application it was an interesting lesson about some bits of std::filesystem. In the next posts, I’ll hope to cover more stuff in that area.